New Twingo really does have everything it takes: stunning looks, a footprint tailored for tight city spaces, and a dizzying turning circle. 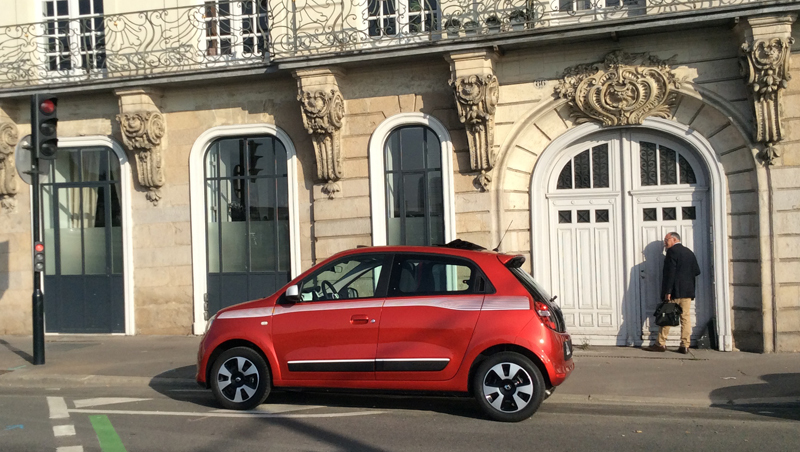 That's the impression we got from our two-day test-drive experience with New Twingo in the Nantes region. Ever since I saw New Twingo at the Geneva Motor Show, I'd been dying for a chance to get behind the wheel. The chance came last week, and I was not disappointed. There's still no denying that it looks fantastic. It's just a little bit girly, but not too much, and the bold colours are absolutely perfect . Especially the blue, which I adooore. Then there's the simple fact that I happen to live in town, and my two days with New Twingo leave not the slightest doubt in my mind that this is the car I need for driving in Paris. Everything feels right, right from the start, as soon as you climb in. Despite outside appearances, there really is plenty of room inside. Though New Twingo is actually a full 10 centimetres shorter than its predecessor (at 3.59 metres) passengers actually enjoy 33 centimetres more space inside, from dashboard to boot flap. This gives New Twingo the best exterior/interior ratio in its category. And knee radius, front and rear, is among the best too, at 13.6 cm. Like I said, it feels right. Luggage room is comfortable too. The boot measures 219 dm3, and its floor is flat and rectangular which is highly convenient for suitcases and shopping bags alike. 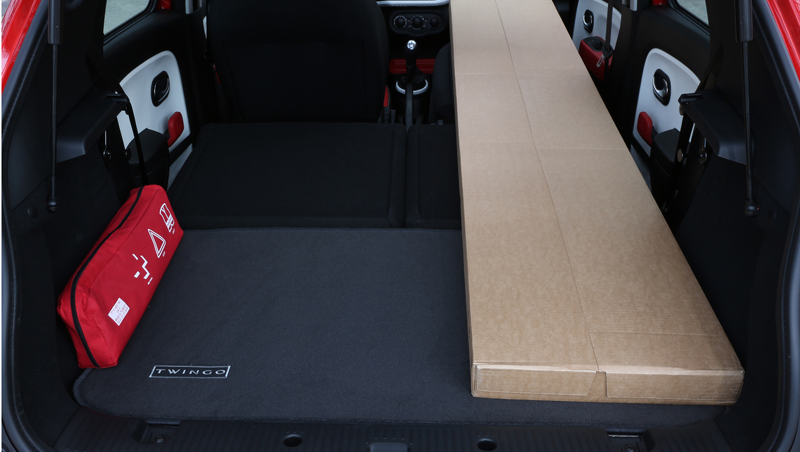 And we actually did the test: you can indeed load a Swedish-made pine shelving unit lengthways after folding down the rear bench and front passenger seat. But best of all is the boot width: there's no wheel-arch intrusion into the raised boot space, so loading a fold-up pushchair is a piece of cake. All you parents out there will know exactly what I'm talking about! Versatile, spacious, and comfortable: our first impressions are borne out. The suitcases are in, and we're sitting comfortably, ready for a run round the famous Guérande salt marshes. We're naturally wondering if the ride is going to feel any different on account of the rear-mounted engine. But in fact New Twingo behaves like a front-wheel drive. Roadholding is reassuring, owing to the car's excellent front-rear weight distribution (45% front and 55% rear, compared to 70%/30% on front-wheel drive models) and to the wheelbase and short front and rear overhangs. After the seaside we're back in Nantes, an ideal environment for trying out Twingo's legendary manoeuvrability. The first thing we notice is the greatly improved front axle mobility than comes from the rear-mounted engine placing. Specifically, the turning radius shrinks to just 4.30 metres. That means Twingo can get by with a whole metre less than its rival to do a U-turn. Amazing! And because the front wheels turn through a whole 45 degrees, in-line parking becomes childsplay. 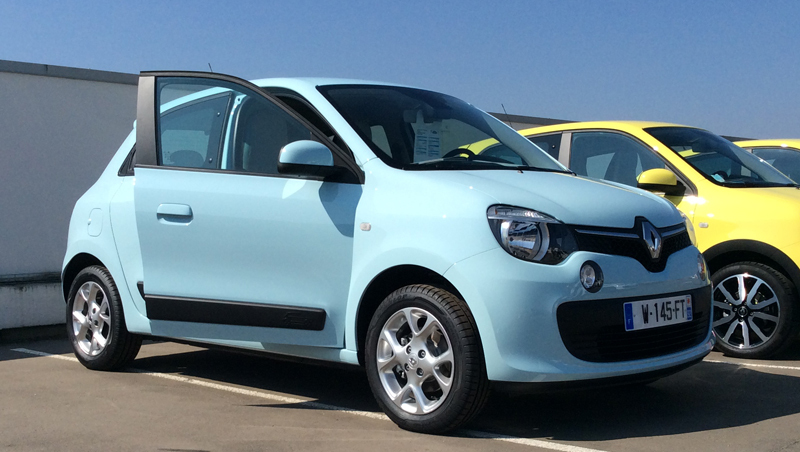 New Twingo comes with a choice of two engines: Energy TCe90 and SCe 70. The Tce90 three-cylinder turbocharged unit belongs to the Renault Energy line, and is already used on Clio and Captur. Power peaks at 90 bhp, which on a vehicle of this size makes for real driving sensations. And torque of 135 Nm ensures prompt response from low engine speeds. 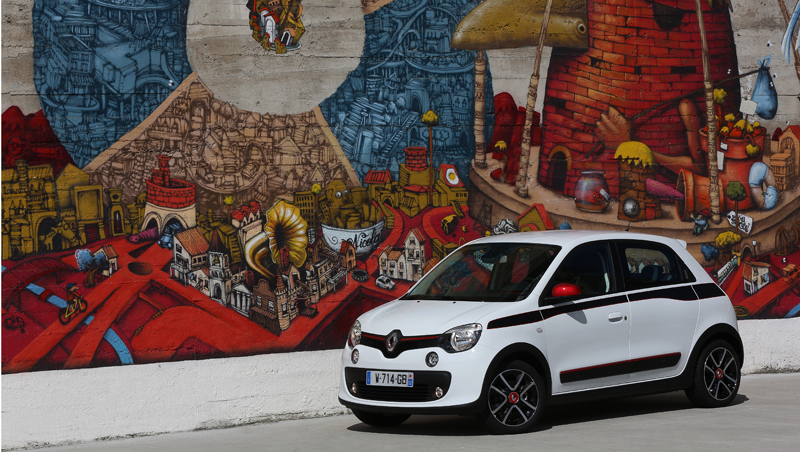 Alternatively, New Twingo is powered by the new SCe 70 engine, a normally aspirated unit designed for city driving. It's supple, powerful, responsive from low revs, and very economical, consuming no more than 4.2 litres per 100 km*. Difficult to imagine a better match for Twingo the city car. * Fuel consumption and emission figures certified to current European standards. 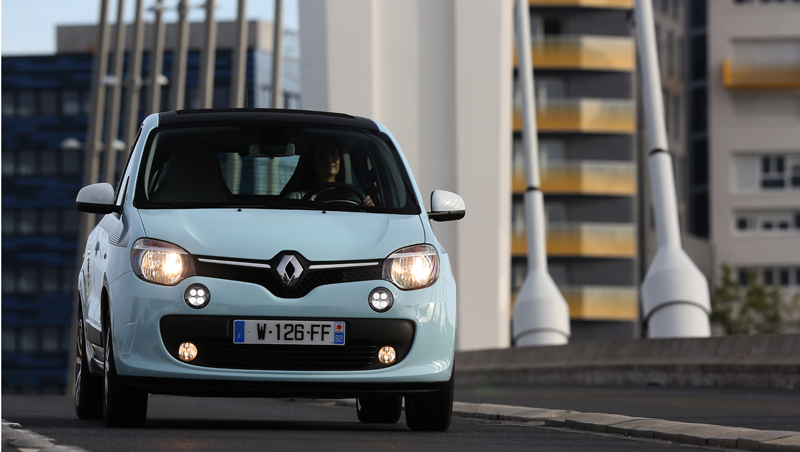 From the second trim level upwards, Twingo features Renault's new smartphone-based R&GO system. 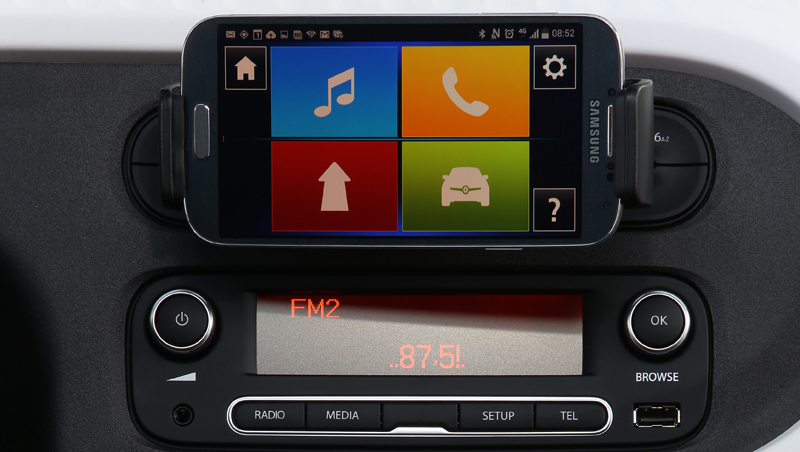 The driver's smartphone runs an application that gives direct access to four major functions: satnav, telephone, multimedia and vehicle information (whereby the smartphone becomes a second dashboard with functions even including a rev counter). 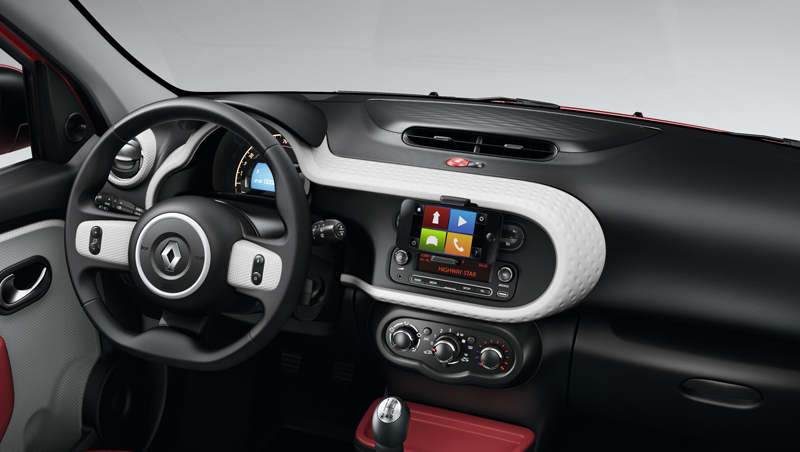 The other system available on Twingo is R-Link Evolution, Renault's integrated multimedia system. Twingo is eminently adaptable, metamorphosing inside and out to reflect the tastes of its driver: assertive, laid-back, sporty, vintage, etc. As well as the various body décors, you can choose between four wheel types and three colours (red, grey or blue) for the wing mirror shells, radiator grille surround and side strips. Inside, the dashboard trim, air vents and steering wheel inserts are also available in a choice of three colours. 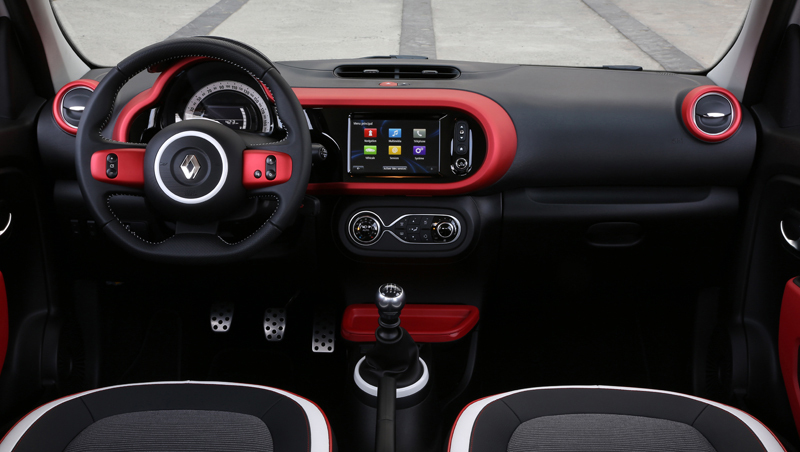 And for the dashboard itself, you can choose between a “golfball” dimple finish or a more classical smooth painted finish, again in a choice of three colours. Basically, Twingo's fantastically versatile in matching its appearance to every owner's personality. Don't know what you think, but I'm delighted by this glittering return to the true Twingo spirit.